Over the past few weeks, the Guardian has published a number of biased and misleading reports supporting the right wing opposition in Nicaragua and advocating regime change. The reports contain quotes and testimony from critics and opponents of the Nicaraguan government only and completely ignore the fact that much of the violence in Nicaragua is now coming from the protesters rather than the government. People in Masaya, for example, are in fear of their lives if they can be identified as pro-government supporters or Sandinistas. The Inter American Committee of Human Rights has condemned the harassment and intimidation being carried out by opposition groups, but the Guardian has failed to give this even a passing mention. NSCAG has passed on detailed information to the Guardian about this, but they continue to publish reports such as the most recent with the headline 'Nicaraguan protest leaders call 24 hour strike to oust Daniel Ortega'. In fact, the stoppage was a complete failure, with transport, hospitals, schools working normally and many self-employed workers continuing their daily work in order to earn a living. "Your report on Masaya ("Nicaragua's Sandinista stronghold is a city 'at war' with the president") states, with reference to the current appalling violence in Nicaragua, that people have been killed "allegedly by police and paramilitary gangs operating at the government’s behest". However the word from Masaya is the opposite: the town has been taken over by protestors, who are using violent tactics against the population, imposing roadblocks and specifically targeting and threatening government supporters (which at the last election was 72% of the population) with arson attacks on their houses. They are preventing people from going to hospital and getting to work and obstructing deliveries of food and medicines. In short, they are trying to bring the country to its knees, creating misery and devastation for families and communities. The report refers to the famous artisan market, on which many local families relied in order to earn a living. This too has now been destroyed by the opposition gangs – yet another example of the wanton violence and destruction being carried out by these groups. The report, against mountains of irrefutable evidence, footage, photographs and testimonies, gives the seriously erroneous and misleading impression that the violence is predominantly or exclusively carried out by state forces, giving the impression of an authoritarian and repressive regime. It also seeks to exonerate those who are now responsible for continuing violence and sabotage and to implicitly justify their actions as a prelude to regime change. 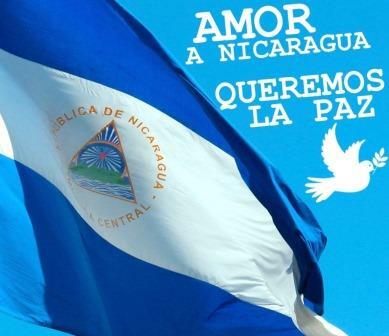 The Nicaraguan government has repeatedly called for an end to violence and for peace and dialogue, a call now supported by the Organisation of American States and the United Nations. However, the opposition have refused to accept this and say they will accept nothing less than regime change. They have now called upon Trump to help them to oust the democratically elected President of the country. It is to be hoped that peace and stability will soon return but it is going to take years now to rebuild a country which only months ago was known to be the safest country in Central America, with a vibrant tourist industry and social and economic progress which had earned worldwide praise."